Taste test: These chips tasted like Cool Ranch Doritos upon first biting in, followed by a good heat, and then a lingering hot aftertaste. 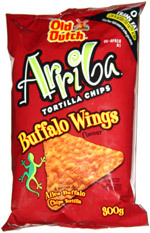 The flavor didn't actually resemble the taste of Buffalo wings at any point. The chips triangular tortilla chips were quite good nonetheless, with great crispness, and lots of the ornange-red flavor seasoning. 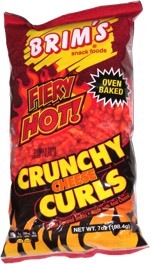 These are a very tasty alternative to Doritos. Smell test: Smells kind of like extra-spicy Doritos.